Here’s a timepiece that will appeal to Porsche fans and those into motorsport-themed watches. 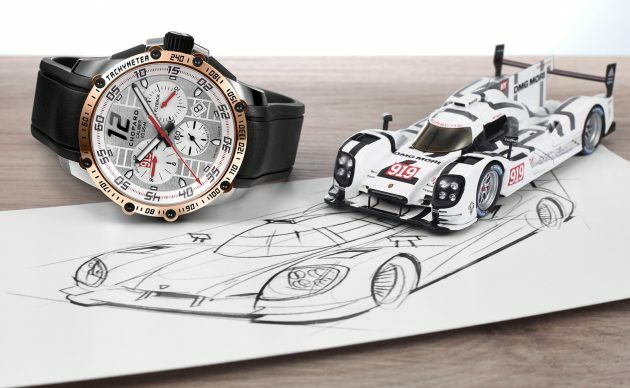 The Chopard Superfast Porsche Motorsport 919 is a limited edition dedicated to the victory of the Porsche Motorsport team in the 2015 FIA World Endurance Championship (WEC). Porsche claimed the WEC Manufacturers’ Championship by racking up a string of podium finishes throughout 2015, the most impressive of which was its double victory in the 24 Hours of Le Mans. The trophy joined the one earned by the drivers (Mark Webber and Brendon Hartley) who finished the season at the top of the standings. Chopard has been the team’s official timing partner since 2014. The Superfast Porsche Motorsport 919 reprises the design codes of the winning Porsche 919 Hybrid race car. Issued in a 17-piece limited edition, the COSC chronometer-certified chronograph watch is a large one with its 45 mm diameter stainless steel case that is water-resistant to 100 metres. The tachymeter-equipped bezel is crafted in 18-carat rose gold and secured by eight blackened screws. The screw-lock crown is adorned with a black rubber-moulded steering wheel, while the striped sides of the case recall the cooling vents on racing engines, and are matched by the linear dial motifs and the openworked movement bridges. The stripes on the dial evoke the rear diffuser of the LMP1 car, and there’s a 919 logo in a red rectangle. The Superfast’s engine entirely developed, produced and assembled by Chopard. The Chopard Calibre 03.05-M mechanical self-winding chronograph movement, equipped with a flyback function, is chronometer-certified by the Swiss Official Chronometer Testing Institute (COSC). The calibre and its openworked oscillating weight are visible through a sapphire crystal engraved with “Official Timing Partner Porsche Motorsport” and “Winner World Endurance Championship 2015”. This very exclusive watch comes with a black rubber strap inspired by racing slick tyres, secured by a polished stainless steel folding clasp. Only available at Chopard boutiques. So are these available in Malaysia? Yes, there are at all Chopard boutiques (Pavilion 2nd Floor and KLCC, Ground Floor). Yes, they are available at all Chopard boutiques (Pavilion 2nd Floor and KLCC Ground Floor). Previous Post: AD: Own a new Subaru WRX from just RM199,800!